Arriving at around 5 in the afternoon, we decided to visit Duckfat for our first meal of the trip. Hand-cut Belgian fries with horseradish mayo and truffle ketchup. Fried in duck fat, the fries were crispy and paired nicely with our choice of sauces. Wild Maine Blueberry Milkshake and Strawberry Buttermilk Milkshake. The shakes were so creamy and thick, I absolutely loved them. 10/10 must try along with the poutine! Poutine with a sunny-side up egg. This was one of my favorite dishes of the night. I loved the combination of cheese curds, duck gravy, and fresh chives with the fries. Slow Roast Pulled Pork Cubano and Braised Beef Paninis. After a very filling and delicious dinner, we called it a day and went back to our hotel for some rest. We planned to grab brunch at Eventide right when it opened to beat the crowd and get an earlier start to our day, but as we arrived there was already a queue extending from its door! 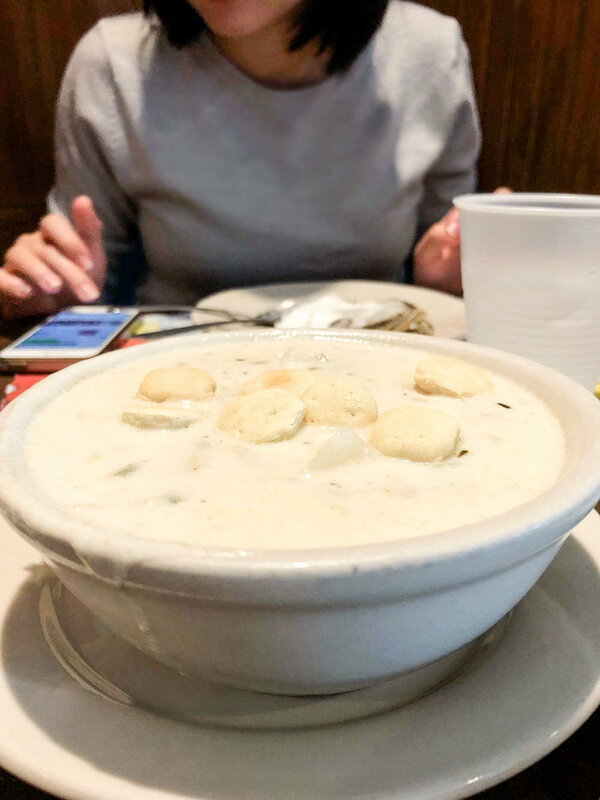 We drove to J’s Oyster instead and enjoyed some fresh oysters, steamed clams, clam chowder, and lobster rolls… just the usual New England feast. Half a dozen fresh Virginia and Maine oysters each. 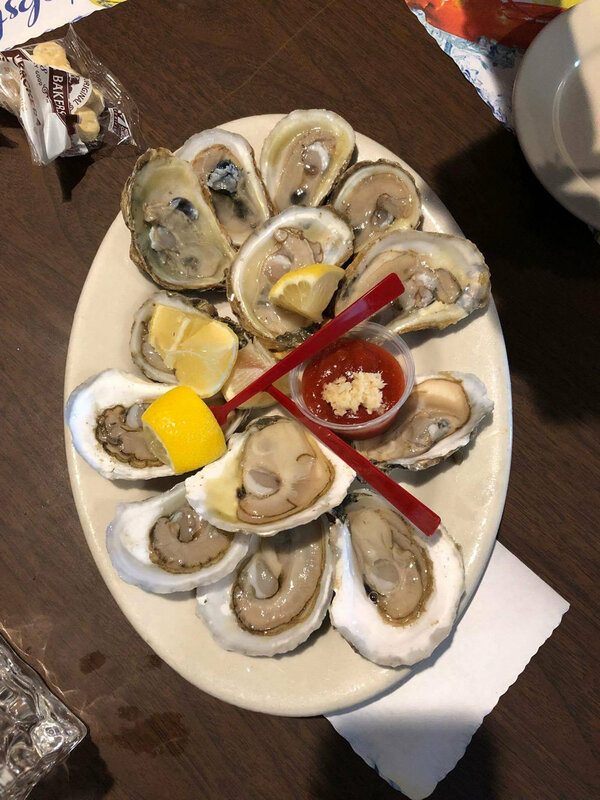 The oysters were so fresh; definitely recommended for anyone looking for fresh seafood in Maine. Small bucket of steamed clams. It was my very first time having steamed clams and I really like the pairing with butter. Lobster Roll with pickles, chips, and mayo. Who doesn’t love a classic lobster roll with Maine’s very own fresh catch? We also visited The Holy Donut situated right on Exchange Street, one of Portland’s main streets. With five of us on this trip, we bought a dozen donuts to-go for our drive to White Mountains, NH that afternoon. A dozen donuts made with Maine potatoes. These donuts were definitely the highlight of our trip. They were all so flavorful, yet not too sweet. My personal favorites were the Maple Bacon and Triple Berry. Make sure to visit them earlier in the day before they sell out! With the help of Yelp, we settled on the Water Wheel Breakfast and Gift House for a classic home-style breakfast to start off our last day of the trip. Mt. Madison with a chocolate chip pancake, scrambled eggs, home fries, toast, and Canadian Bacon. I love all things breakfast so the massive pancake was also one of the highlights of this trip! We finished off our trip with some Korean beef soup at Seoul Soulongtang in Packard’s Corner after our drive back to Boston. Soulongtang (Ox Bone Soup) comes minimally flavored so you can add salt, pepper and spring onions according to your own taste. The soup comes with briskets and is normally eaten with rice.